The worldwide influence of the Roman Catholic Church emanates from the Holy See, the Church’s central government headed by the Pope, physically located within the territory of the Vatican State inside the city of Rome with a population of 821. The Holy See has diplomatic relations with world nations which maintain two separate embassies in Rome: one to Italy and one to the Holy See! Now why the hell, one wonders, should Argentina or the USA, China or Gabon maintain diplomatic relations with a church? Likewise the Holy See has embassies around the world, the nunciatures, while from day to day, from year to year, insists on meddling in Italy’s and world affairs. After his election as Pope in 2006, one of the first acts of Benedict XVI was a triumphant cortege through the streets of “Italy”, just across the Tiber River from the Vatican. 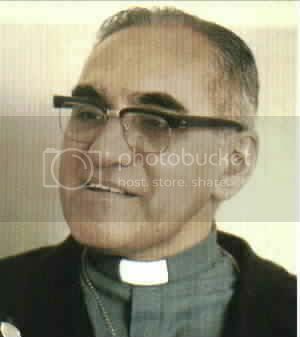 Monsignor Romero remains a hero and an inspiration to his long oppressed people and to all those who love justice around the world. 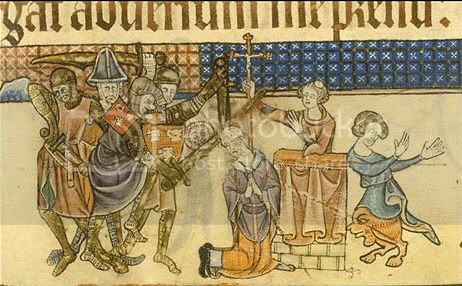 Becket’s assassination. Another illumination of the vile act. The reality was less a story of martyrdom—which Thomas in Eliot’s play viewed suspiciously as a human weakness—than it is a story of a political assassination, relevant in all times, as in the USA, as in El Salvador. While Romero’s assassination was in the name of capitalist imperialism, Thomas was murdered by the State of King Henry II in order to supplant Church law with his State courts and trial by jury (especially in the case of criminal clerics who normally escaped real punishment in church courts) and constitutional and legal reforms—the wrong thing though for the right reason. In that sense the murder of Thomas Becket at Canterbury was of less importance then than the assassination of Archbishop Romero in El Salvador today. Thomas’ was in fact more a rogue killing by soldiers who thought they were carrying out what their King wanted done. Maybe Becket died from an act of stupidity—which was most certainly not the case of the murders of Oscar Romero and Martin Luther King. In the latter, power knew exactly what it was doing. And one more king is another reign.? Gaither Stewart, based in Rome, is a Cyrano’s Journal’s Special Contributing Editor and European correspondent. His reports and essays are widely circulated throughout the web and have been translated into many languages. Inspiring and touching essay that dares to discuss topics that are normally neglected in both media and academia. Mr Stewart is to be commended.